Redrac Landscapes - Driveways/Patios/Paths, Landscaper based in Sandhurst, Berkshire. 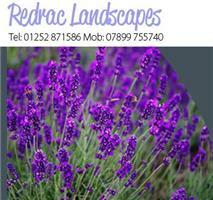 Redrac Landscapes was formed in 1990 and is a family run business. We specialise in all forms of hard landscaping including drives, patios, walling, fencing, turfing etc. I have been working in landscaping since 1976 so has plenty of landscaping experience and the main aim of the company is to promote a high level of quality and service to our customers. We are able to undertake all manner of garden work, from full garden redesign to the paving of patios, relaying driveways and the erection of all types of garden fencing. We are able to source all the materials you need including premium decking timber, fencing, building materials, all manner of plants and garden lighting and artificial grass and lawns. Our landscape gardeners are able to offer their expert advice on everything from shingle driveways and paving to relaying driveways and closed board fencing. We are proud to offer a level of after sales care that is rarely beaten within the landscaping and garden services industry. We are Checkatrade certified and are always happy to show you examples of some of the amazing landscaping projects we have completed in the past.